A combination of Israeli art, Israeli Judaica and practical Judaica, this is a Hanukkah menorah featuring the figure of a deer looking at a Sabra, a type of cactus native to and associated with the Land of Israel. The perfect Hanukkah gift and home for your Hanukkah candles. Of all the symbols of the Jewish festival of Hanukah (also spelled Hannuka and pronounced Chanukah in Hebrew), without a doubt the Hanukah menorah (sometimes spelled menora, and known as a Hanukiah, or Chanukkiah in Israel) is the most prevalent, leaving the dreidel (spinning top), latkes (potato pancakes), Hanukah gifts and jelly doughnuts behind. On each of the eight nights of Hanukkah the entire family gathers around for the ceremonious lighting of the Hanukkah candles. On the first night one candle is lit, and on each subsequent night another candle is added, until on the eighth and final night all eight candles shine together in harmony, joined by the shamash, the ninth candle used to light the other and then displayed alongside them. 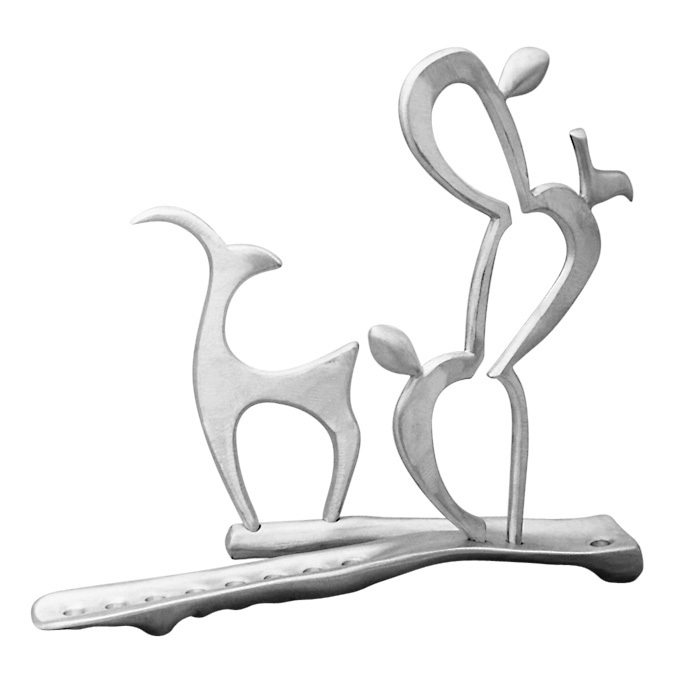 Shraga Landesman, the acclaimed and award-winning Israeli artisan, photographer, sculptor, silversmith and goldsmith has dedicated the past decade and a half to creating original yet classy pieces of Israeli Judaica which double as unique pieces of Israeli art. In this menorah, Shraga has succeeded once again in infusing a natural, Israeli flavor into the classic Jewish tradition. The menorah features a base shaped live a V, albeit with one side shorter than the other. The longer side contains eight holes meant to house the eight Hanukkah candles. Next to the holes, towards the base of the V, a sabra bush rises majestically, with a bird perched on it. The sabra is a type of cactus, and is used as a synonym for someone born in Israel, because of its nativity to the Land of Israel and because its combination of a prickly exterior and sweet interior can be used to describe the stereotypical Israeli. At the base of the V, there is a ninth hole, meant for the shamash. On the shorter side of the V a deer stands, gazing backwards at the sabra. The deer is also native to Israel, completing the serenely natural landscape. The contrast between the peaceful, natural setting and the Hanukkah lights, symbolizing an unnatur al miracle, offers much food for thought and is a great topic for discussion. Measuring 32X28X10 cm (12.8 x 11.2 x 4 inch) and made of cast aluminum, this is a truly unique piece of modern Judaica, and makes the perfect Hanukkah gift, Bar/Bat Mitzvah gift or anniversary gift.